There is a lot of debate about whether we should even bother to eat our essential oils since applying oils to the skin can be extremely effective. I am willing to try all methods of using essential oils to get the maximum benefits of the oils. Not all essential oils can be taken internally, in fact it can be dangerous if they are not food grade or generally recognized as safe (GRAS). It is better to assume that your essential oils CANNOT be taken internally unless it is specifically stated that it is safe to ingest. The only brand I would recommend taking internally is doTERRA because their oils are100% pure, therapeutic grade with no other harmful chemicals mixed in with the oil. If you are unsure about whether to do this it is better NOT to do this. Essential oils are so highly concentrated that it’s better to take LESS not more. Start with just one drop of doTERRA Food Grade Essential oil diluted in a glass of water and sip it slowly. YOU MUST ONLY DRINK YOUR ESSENTIAL OILS FROM A GLASS. If you add essential oils to a plastic cup it can leach the plastic into the water, which is very harmful for you. Always do a skin sensitivity test before ingesting any essential oils to make sure you do not have any allergies. Some oils that are safe to ingest are ‘hot’ oils and they will sting your mouth if you don’t dilute them, so it is better to do your research and follow the advice of an expert when it comes to ingesting oils. 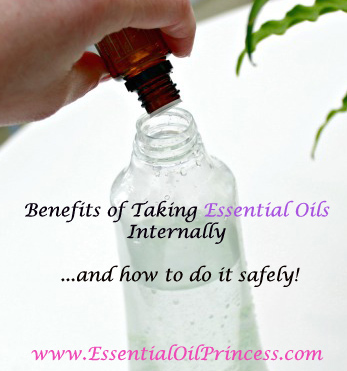 I would get the advice of an expert before giving essential oils internally to children, pregnant, nursing or elderly. Read this to learn why it is safe to ingest doTERRA essential oils.